Finnish composer Kaija Saariaho has won the 2011 Sonning Music Prize - Denmark's highest musical honor worth 600,000 kroner ($110,000 / €80,500). The award committee called the 56-year-old composer "one of the most outstanding composers of our time." The Leonie Sonning Music Foundation added, Saariaho "has created transparent, vibrant and expressive new music." The award will be given during a concert in Copenhagen on May 5, 2011. "I am especially happy about a Nordic accolade," Kaija Saariaho told Finland's Helsingin Sanomat newspaper on hearing of the award. "My music is not as well known in the Nordic countries as it is elsewhere in Europe, or for example in the US. With the exception of Finland, of course." She also commented that the prize would allow her "the opportunity to compose at a more tranquil pace." 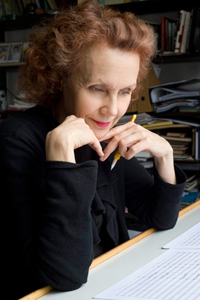 Kaija Saariaho is already the recipient of several high-profile honours including the Wihuri Sibelius Prize 2009, Musical America's Composer of the Year Award in 2009, the Grawemeyer Award (2002), the Darmstadt Kranichsteiner Prize in 1986, and the Ars Electronica Prize in 1989. The Sonning Music Prize has been awarded annually since 1959 to an internationally renowned composer, musician, conductor, or singer. Previous winners include Leonard Bernstein, Mstislav Rostropovich, Anne-Sophie Mutter, and Daniel Barenboim. For more information, visit the website of the Sonning Music Prize.